With a little bit of effort, making elderberry wine can be an excellent way of using up your elderberries to make a natural, crisp elderberry wine. 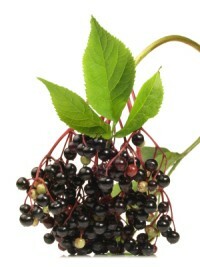 We sell everything that you require to make elderberry wine - except for the elderberries that is! Plant some elderberry bushes and in a few years imagine the tasty elderberry wine that you can be drinking... Here is our guide to turning those elderberries into wine. After stripping the elderberries from their stems using a fork, wash the fruit then place in a sterilised bucket. Pour on 4 pints of boiling water, and add the sugar, stirring until it has all dissolved. Now add the grape concentrate. Add 2 teaspoons of citric acid, and 1 teaspoon of yeast nutrient and the burgundy yeast. Place lid on loosely and leave for 5 days, stirring daily. Using the straining bag and funnel, strain into the demi-john and top up to the gallon mark with cooled, boiled water, if needed. Put water in the airlock and fit into the demi-john, then allow the fermentation to continue. When the fermentation is complete, siphon off the sediment into a clean, sterilised demi-john and add half a teaspoon of potassium sorbate and 2 crushed campden tablets. Remove the bung and airlock. Carefully place your hand over the top of the demi-john and swirl gently, releasing the ‘fizz’. Repeat this until all the ‘fizz’ has gone. Replace airlock and bung or safety cork. Your wine should now be stable, so move it to cool place where it will begin to clear. When it is brilliantly clear your wine is ready to bottle. However, if your wine is to dry you may sweeten it with a non- fermentable, sweetener. Siphon your wine into clean, sterilised wine bottles and using a corker insert a straight cork. You should now label your wine and place a shrink capsule over the cork, this will improve the presentation of your wine. This wine can be greatly improved by adding 1lb of blackberries along with the elderberries. Allow your wine at least 12 months to mature then enjoy your hard work! Remember to sterilise all of your equipment to ensure that bacteria does not spoil your homebrew pear wine! Do you need help or advice with making your own elderberry wine? Use our homebrew advice forum or contact us.